On March 2, 2017, our family rose before dawn, loaded up the van, and left on the longest vacation we’ve ever taken. 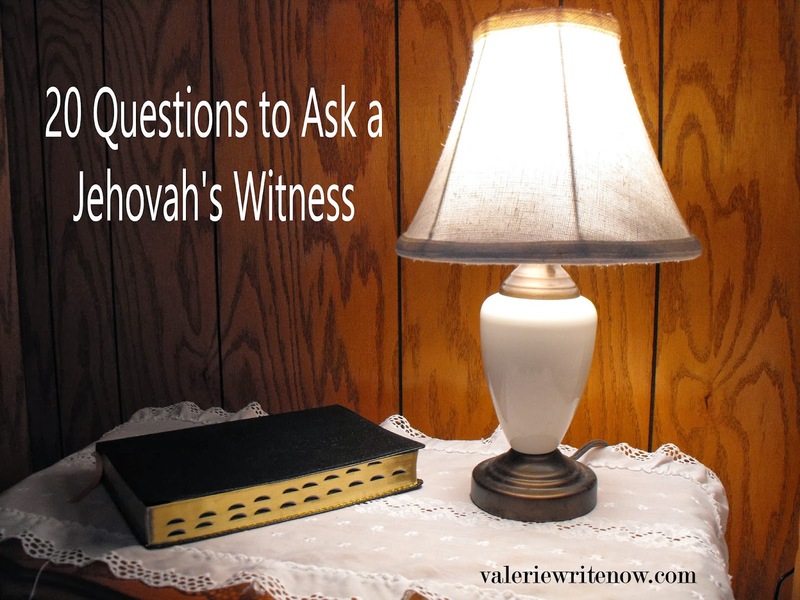 We have been blessed to visit many interesting sites over the years, but they have always been in connection with ministry or visiting relatives. We have never gone so far away for so long before. Lauren, our senior, had said several years ago, that if given the opportunity to go on a “senior trip”, she would choose Washington, D.C. When we lived in Arkansas, this seemed like a big request. When we moved even farther west, it became an even bigger one! Our goal had been to take her last summer, but we had to tell her no due to the lack of time and funds. We encouraged her to pray and to wait on the Lord. The Lord answered us in an amazing way. No sooner had we decided not to go when some friends graciously offered us the use of their time-share in the D.C. area. This would save us a lot of money. The only requirement being that we needed to be flexible on when we could go. 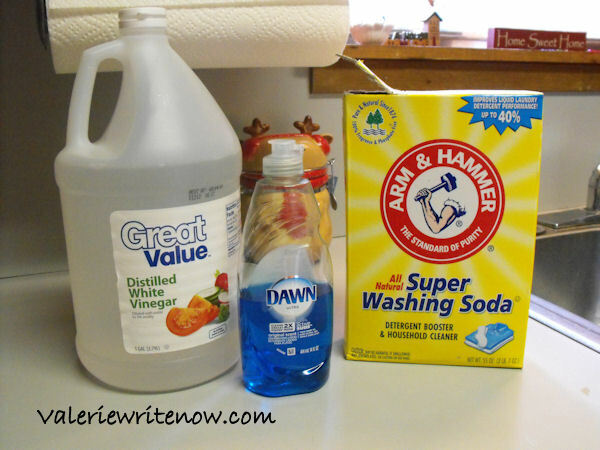 As a homeschooling family, this was something we could do. 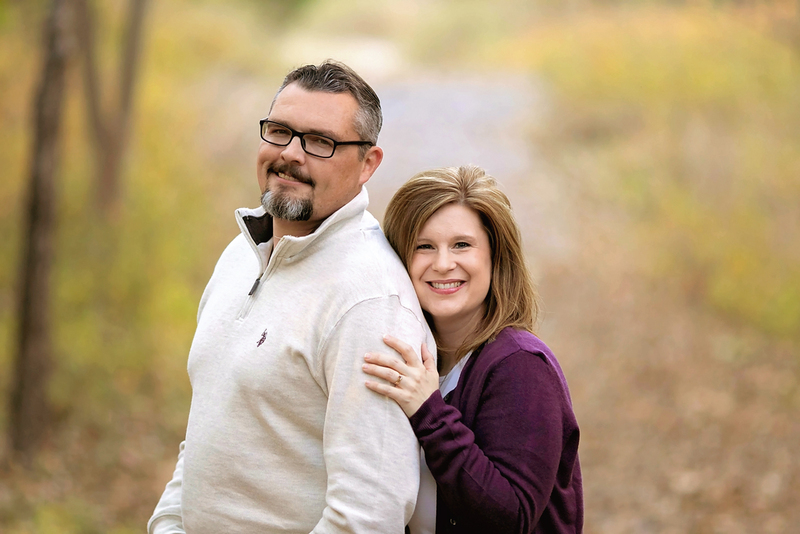 Terry and I saved as much money as we could, and continued to bring it to the Lord in prayer. 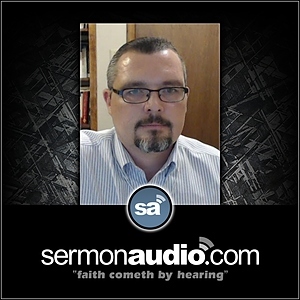 A six-day vacancy opened up in the time-share for March 5-10, so we took that as the Lord’s leading as when we should go. As we mapped out our plan, we realized that we would be in the area of many interesting places. Since we were already traveling over 1,200 miles just to get to D.C., why not make the most use of our time out east? So we did! 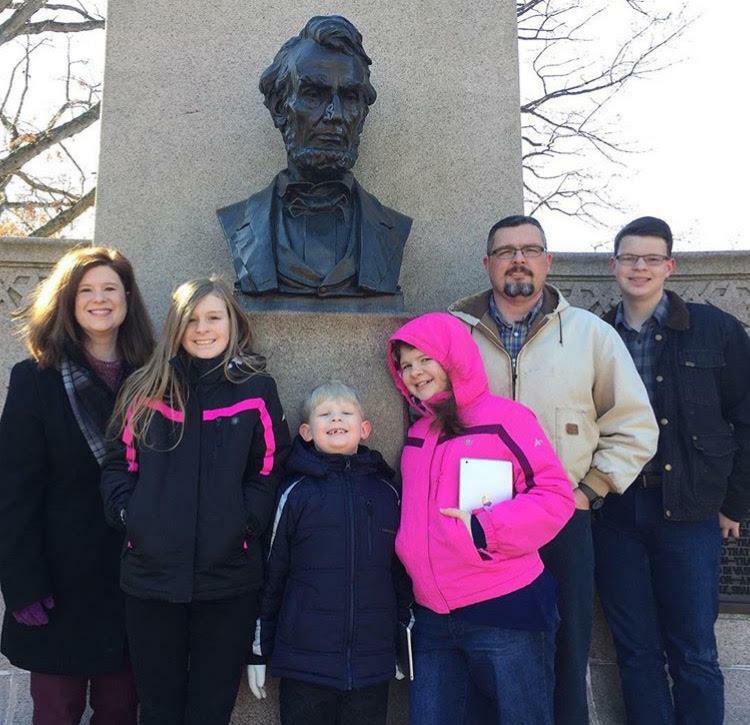 We were able to arrange a trip to Gettysburg, Colonial Williamsburg, Virginia, and Lexington, Virginia, in addition to D.C. I would like to share some of the highlights of this trip with you, and perhaps encourage you to see a few of these places, also. We drove about fourteen hours the first day of our journey, and seven then next day. We arrived in Gettysburg to a lovely hotel (it really saved us money to be going during the off-peak season, which again, was the Lord’s doing). The hotel property backed up against an old cemetery, which the history lover in me found to be quite exciting. 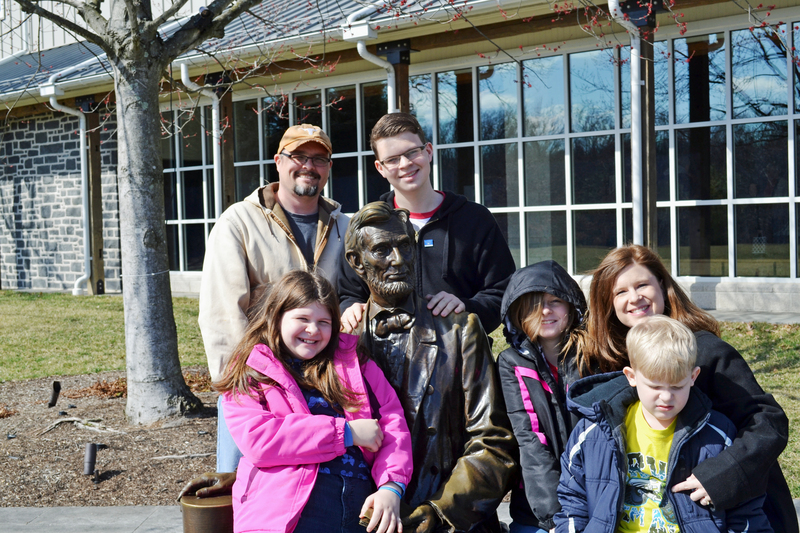 The next day, we headed out early to tour Gettysburg. I read The Killer Angels at the end of last year, which really gave me a better understanding of those three days in July of 1863 and made the visit even more enthralling for me. First, we headed to the visitor’s center. 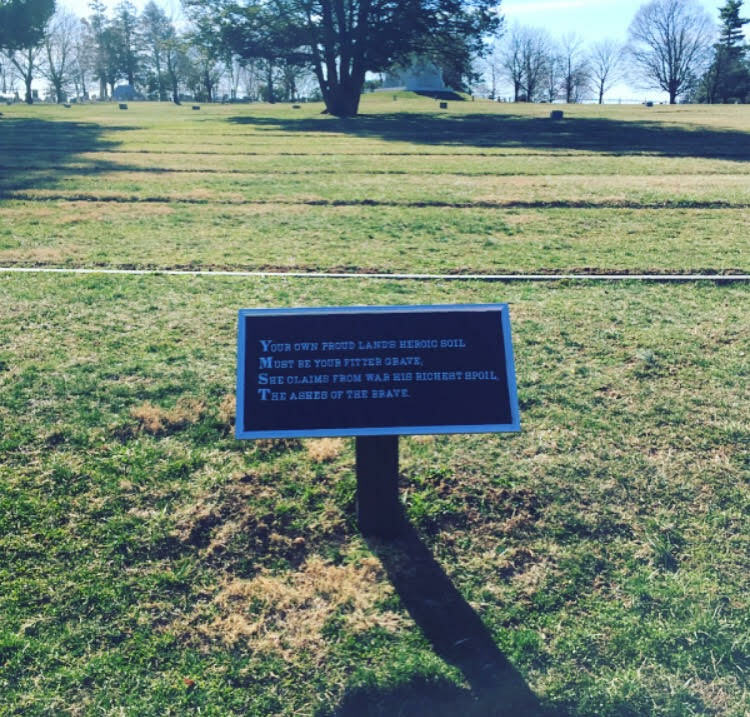 The battlefield can be toured for free, but the museum charges admission. As we were walking into the museum, an elderly couple passed us as they were leaving. The gentleman stopped Terry and said, “Hey, they didn’t take our tickets for the museum inside, would you like to have them? I don’t know if they will work, but you could give it a shot.” Terry thanked him and we went inside. He showed the admissions lady the tickets and she said they were for the wrong time. We thought, oh well, it won’t work. She proceeded to change the time on them and issue us the remaining five that we needed. That gentleman saved us $30! What a blessing from the Lord. The museum was filled with interesting exhibits. The younger ones always seem to run ahead to the interactive parts of the museum, so we had to move quickly. 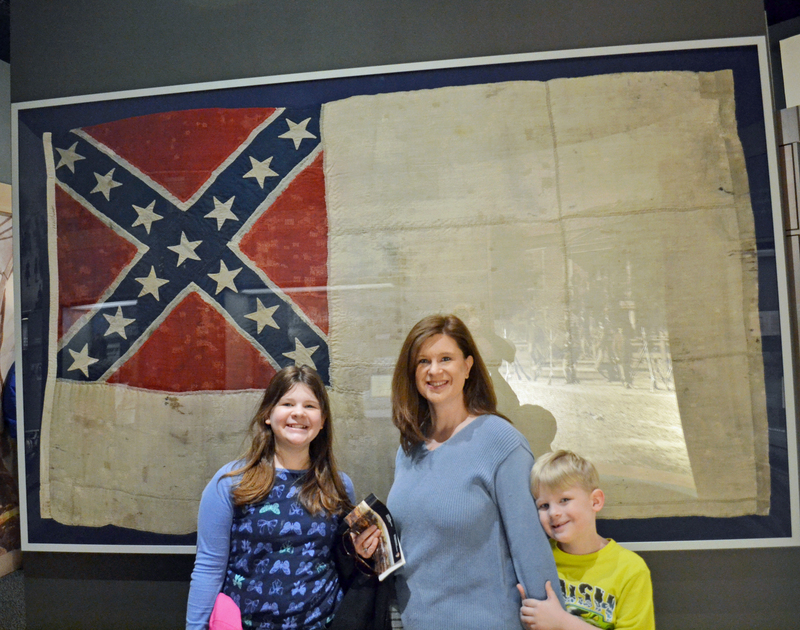 Of course, I had to get a photo with the Confederate flag. 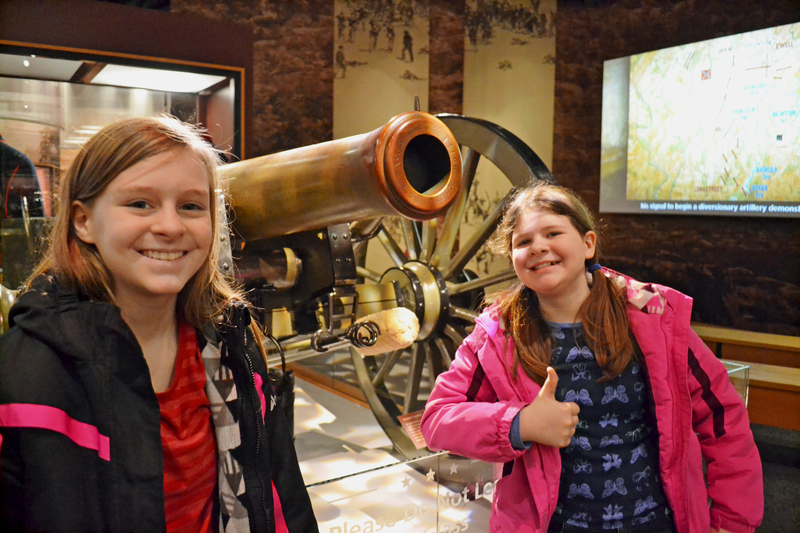 The museum portion of our visit included watching a short film about Gettysburg, seeing the Cyclorama, a 360-degree painting of The Battle of Gettysburg with various sound and visual effects which made it seem like 3D, and the museum itself. 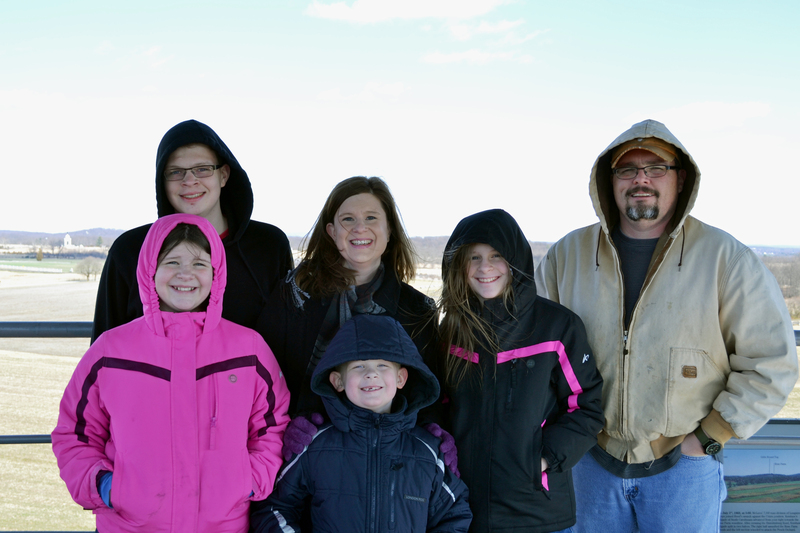 On this trip, we had to take group photos in twos. The person who snapped the first photo then handed the camera off to someone else and we took another with that person in the group. 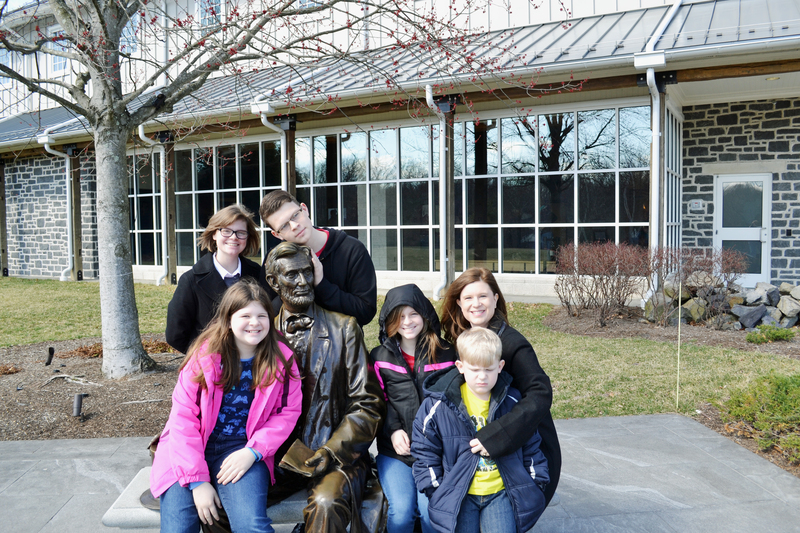 The sun was bright in this photo, but we couldn’t resist snapping a photo with Abe outside the museum. Next, we loaded up in the van and began our own tour of the battlefield. I visited Vicksburg National Military Park last year. It was a brief trip, but we were able to see it all in about an hour. 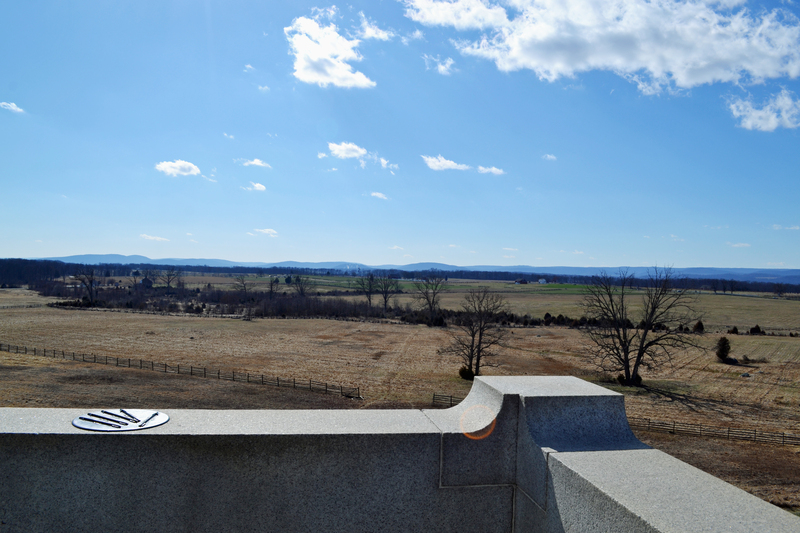 The Gettysburg battlefield is huge. It took us four hours and we still could have explored it in more detail if we’d had more time. It was bitterly cold the day we were there, with strong blasts of arctic air hitting us in the face, yet we soldiered on and had a great time. 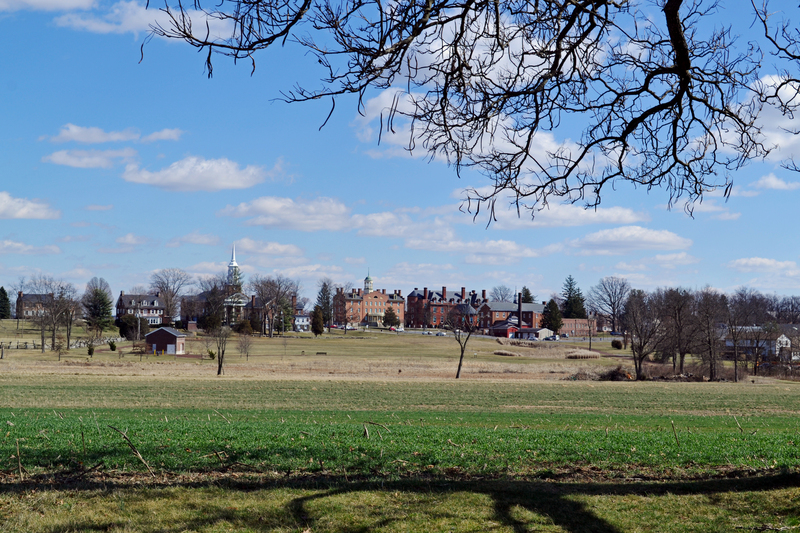 This is the view of Seminary Ridge the direction where Gen. John Reynolds (Union) was looking when he was shot off his horse. He died instantly in the opening moments of the battle. This seemed like a nice place for a photo. Cannons were all over the place. 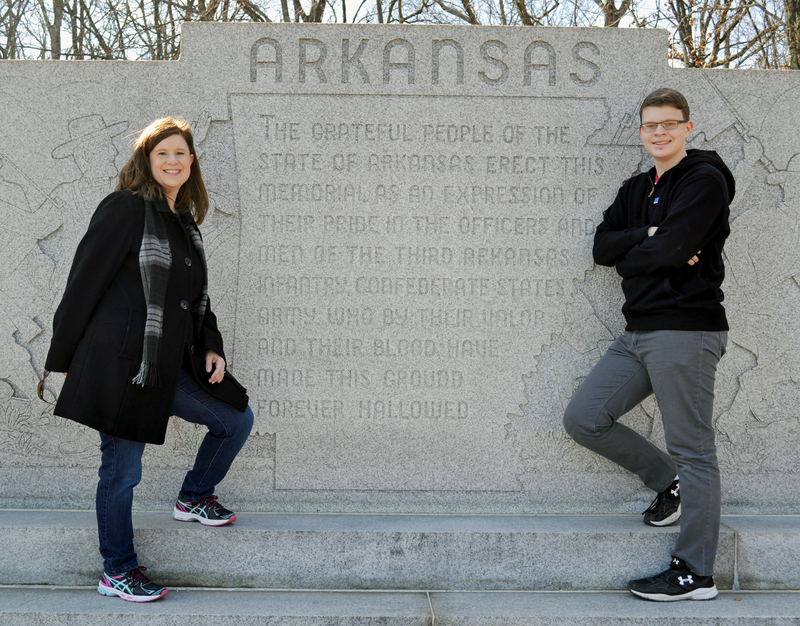 Two Arkansas natives with the Arkansas memorial. 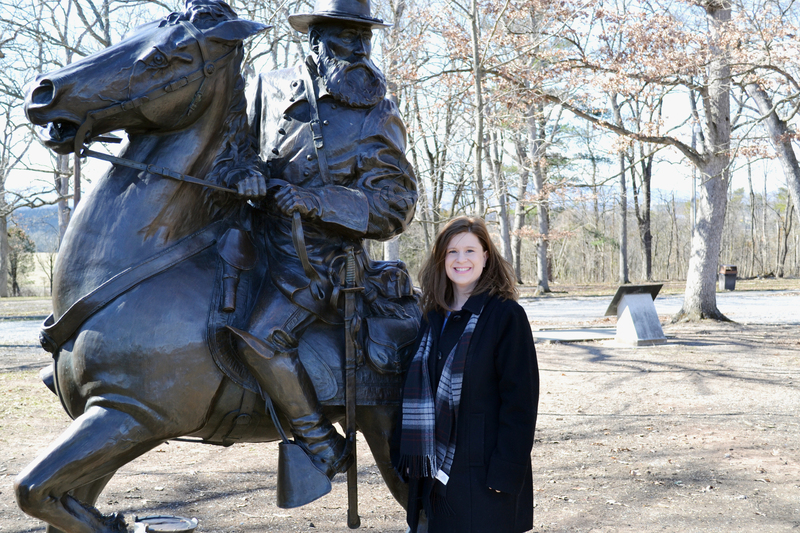 Me with Gen. Longstreet (Confederacy). 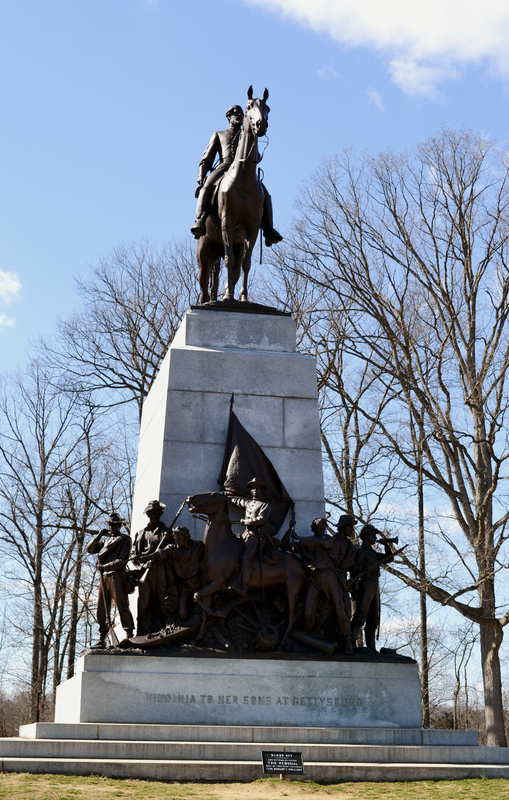 It has been debated that, had Gen. “Stonewall” Jackson not died at Chancellorsville, the south would have won the Battle of Gettysburg. Due to Jackson’s death, Longstreet became Lee’s second in command. There is much more to the story of course, so I encourage to read about the battle and about the men behind it. 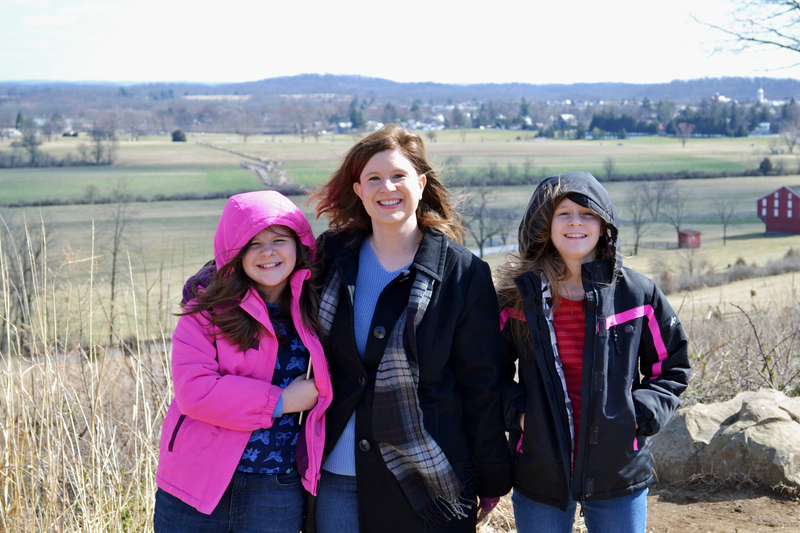 There are three observation towers at Gettysburg. We ended up climbing roughly 37 flights of stairs. I photographed the view from each of them, but they sort of run together after a while. From these vantage points, you can get the big picture of the battle, with the help of placards that explain what is before you. The wind was quite strong up there, so we didn’t get to enjoy the view long. This was the best group shot of the fifty-five we took (haha). 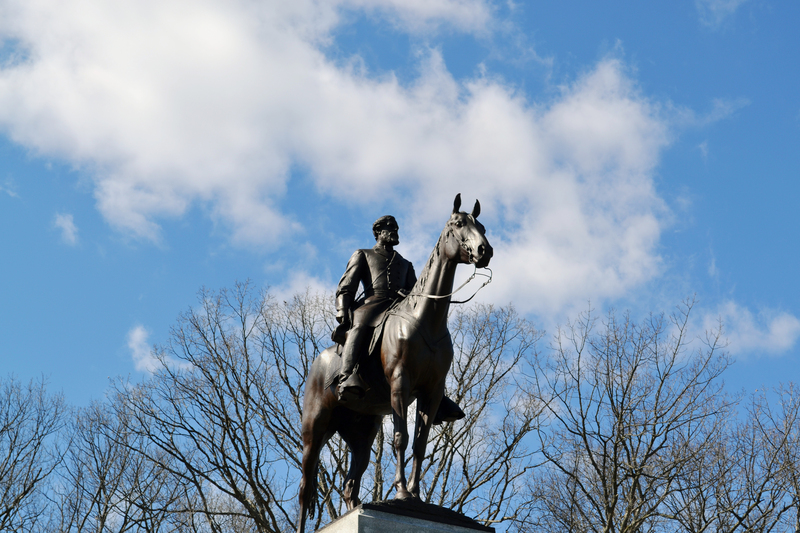 The Virgina Memorial has this amazing monument to Gen. Robert E. Lee and Traveller. 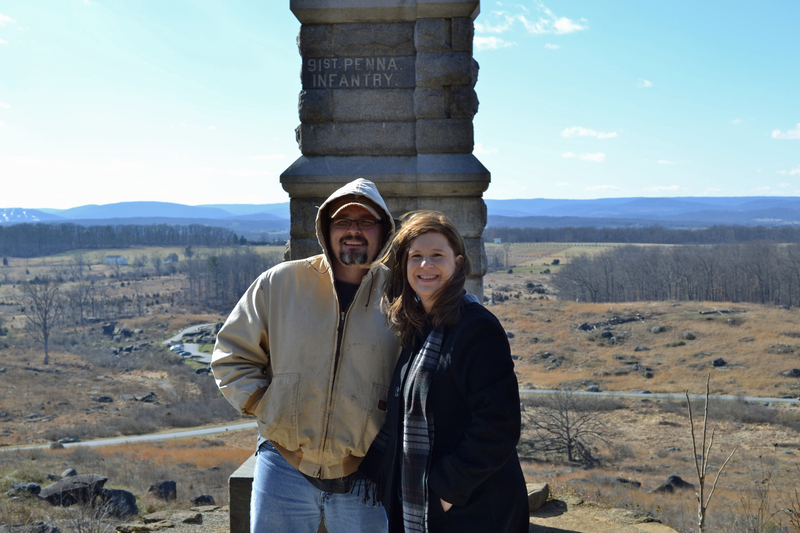 Me and Terry on the top of Little Round Top! I was pretty excited! 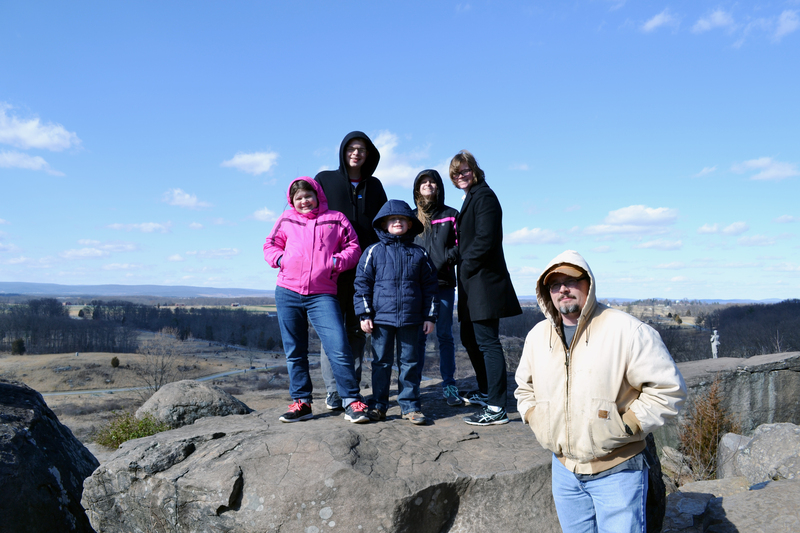 More of Little Round Top. It’s the setting for much of The Killer Angels, hence my excitement at seeing it. 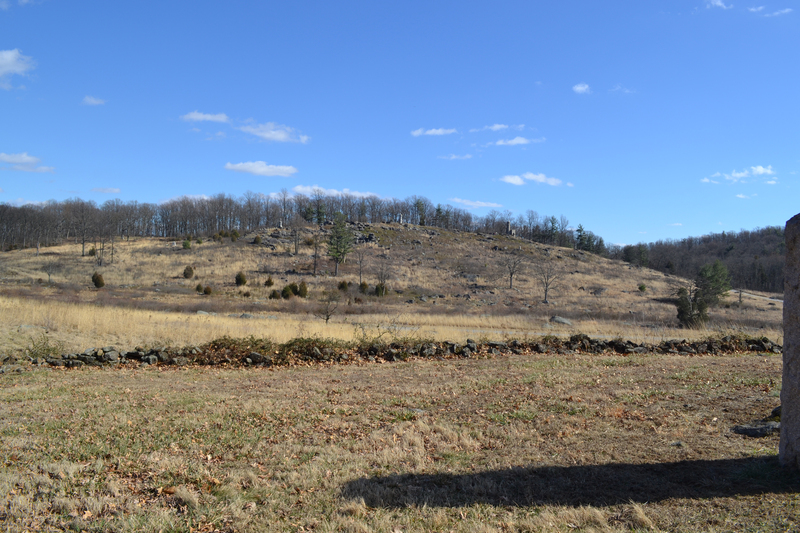 The rock formation below is Devil’s Den – Confederate snipers camped out there and shot at the Union who held Little Round Top. 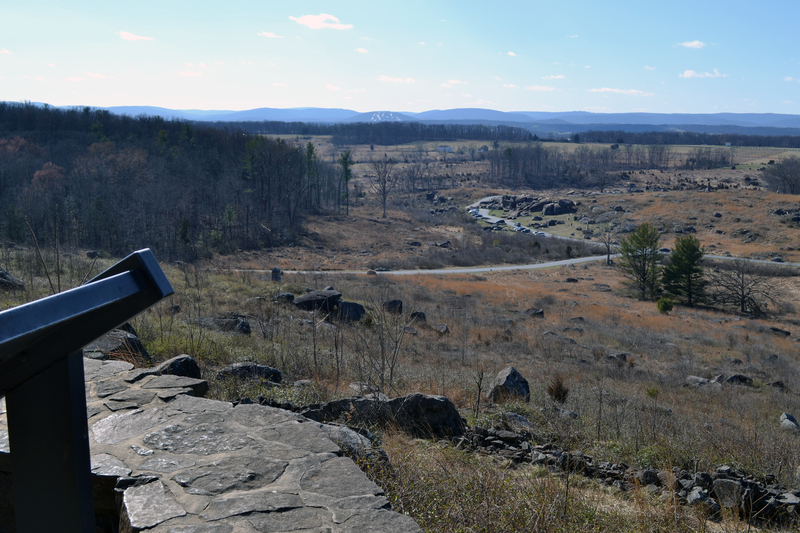 The Confederate’s view of Little Round Top. 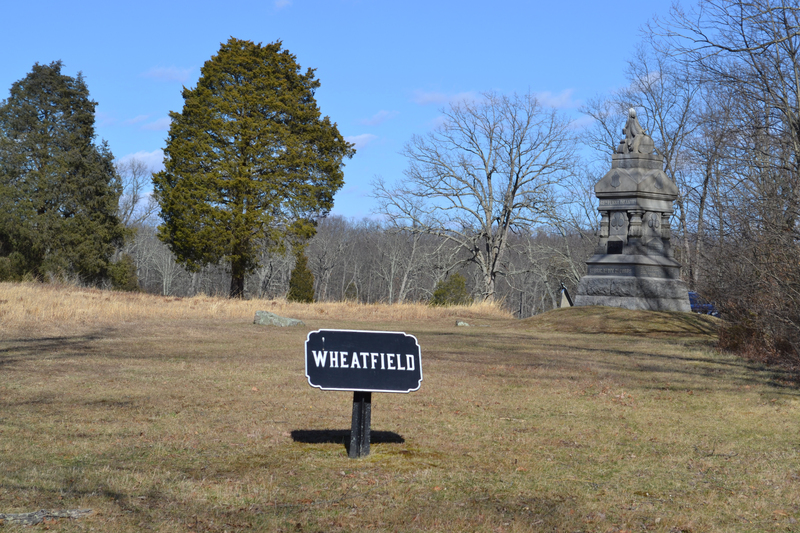 The Wheatfield was the site of brutal fighting, 6,000 men died here. The Trostle House. 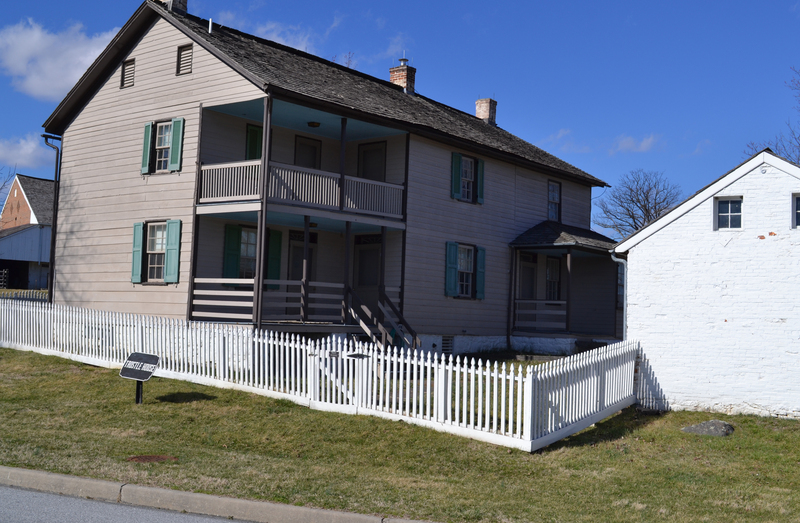 This served as Major Gen. Dan Sickles headquarters during the war. The Pennsylvania Memorial is grand and beautiful. I didn’t realize you could climb to the top of the Pennsylvania Memorial until I heard a faint yell from above. Can you see Mitchell? I had to climb up, too, and get the full experience. Here is the view inside the stairwell. 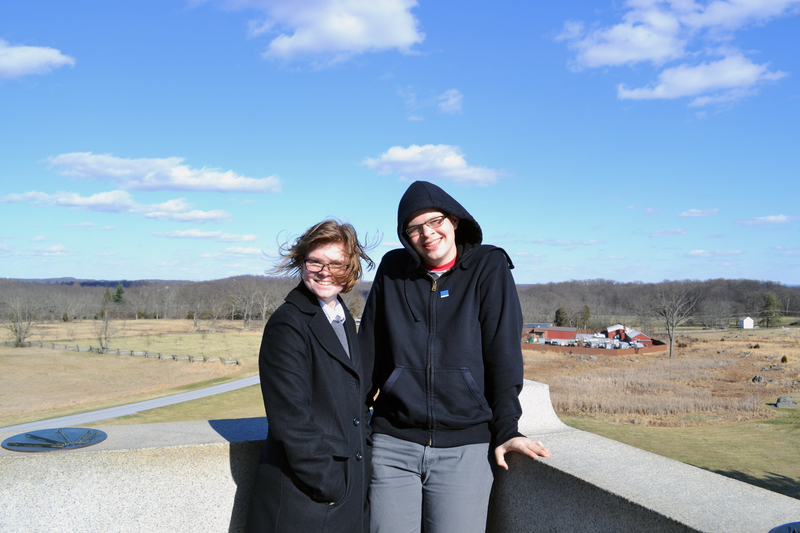 Lauren and Mitch at the top of the Pennsylvania Memorial. The wind was so strong at the top of this monument, that my Nikon lens was shaking. 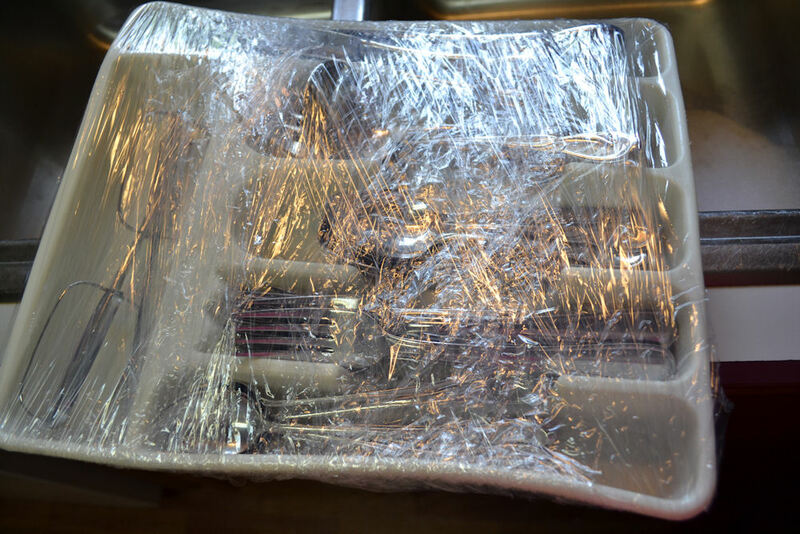 It was all I could do to hold it steady. It still did a good job, though. The round disk on the wall has landmarks listed pointing in their general direction. It was a lovely view. 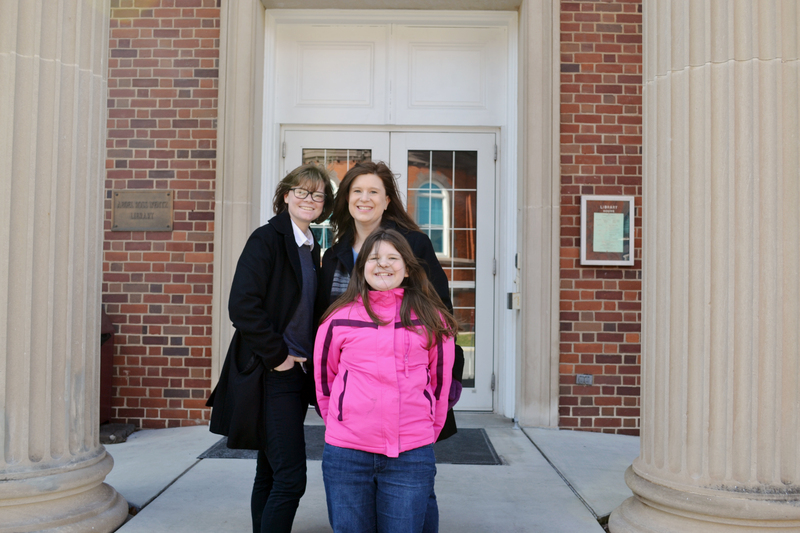 In front of the library on Seminary Ridge. 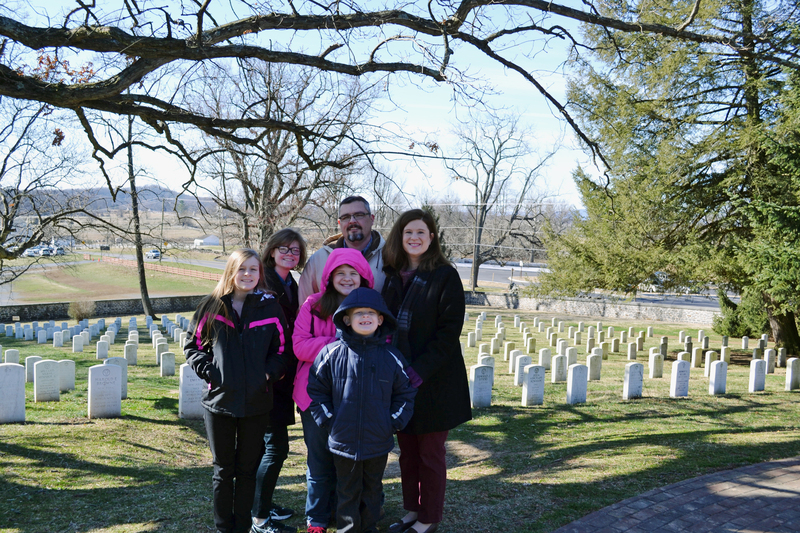 Unfortunately, we didn’t tour the Soldier’s National Cemetery, where Lincoln gave the Gettysburg Address, until Sunday morning before church. The frigid air drained the battery in my Nikon, so this is the last photo I was able to get with it. The next few are from my iPhone. 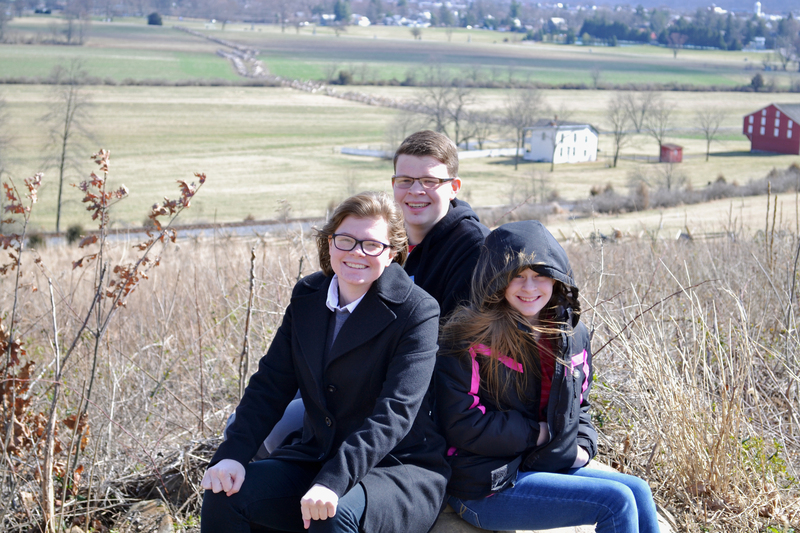 Even with the full day that we spent at Gettysburg, we didn’t see everything. I do hope to visit again someday. Even if I had seen it all, I don’t think I can ever really get enough. 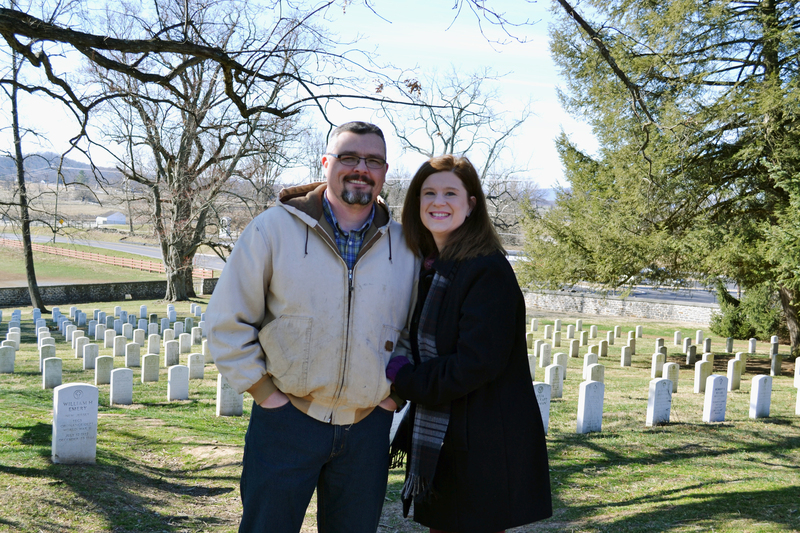 At the church we visited Sunday, I had an interesting conversation with a lady who grew up in Gettysburg. 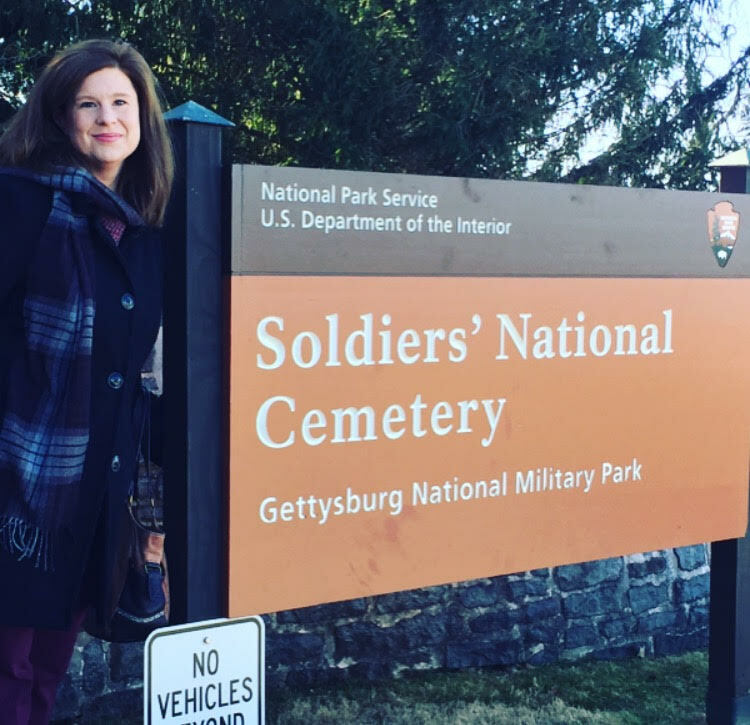 She informed me that the battlefield has really hampered the growth of the town of Gettysburg, after all, it takes up most of the town. As a child, she assumed every town had a battlefield in the middle of it! 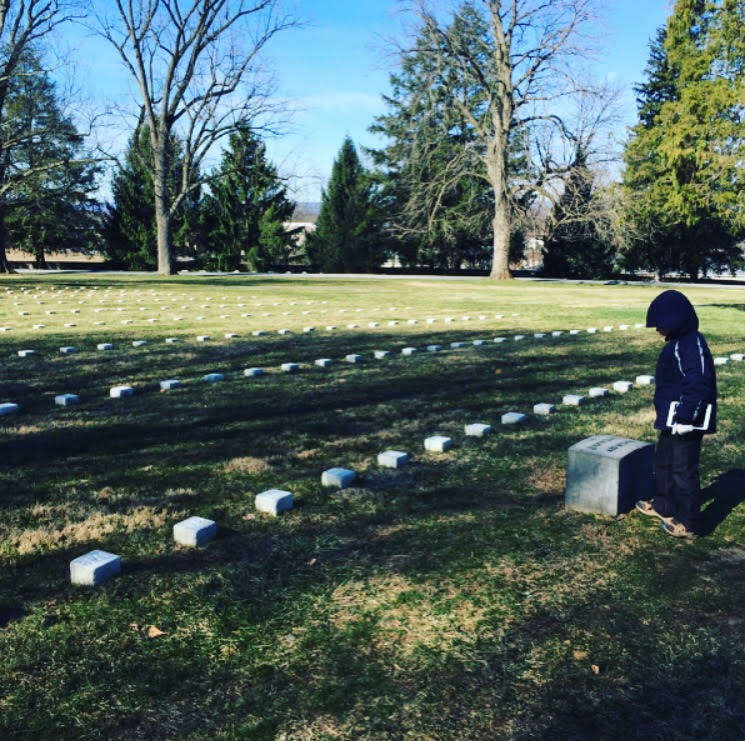 Gettysburg is currently about 8,000 in population, which is how many dead they had to bury in July of 1863. She also told me that many people move there just because of the history. 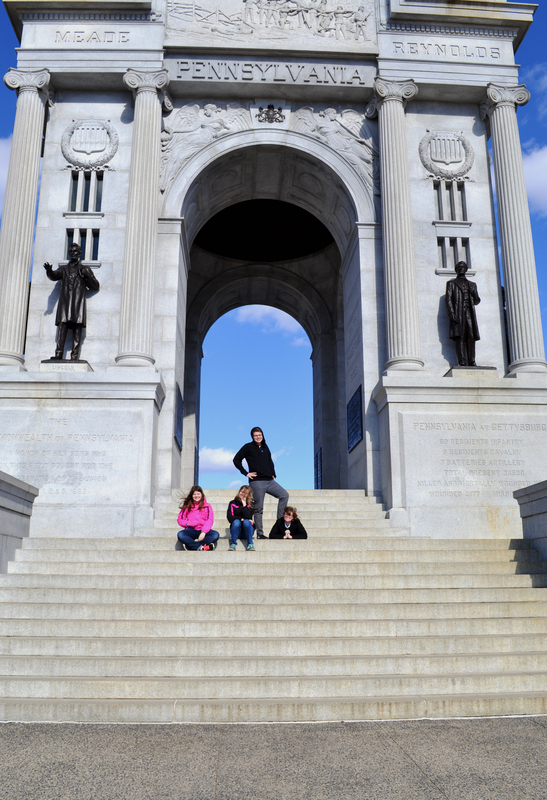 Before our trip, my kids liked to joke that “mom wouldn’t be coming home because she would want to live in Gettysburg”. Well, I did come home, but it’s nice to know that I’m not the only person who would want to move to a place just for its history. 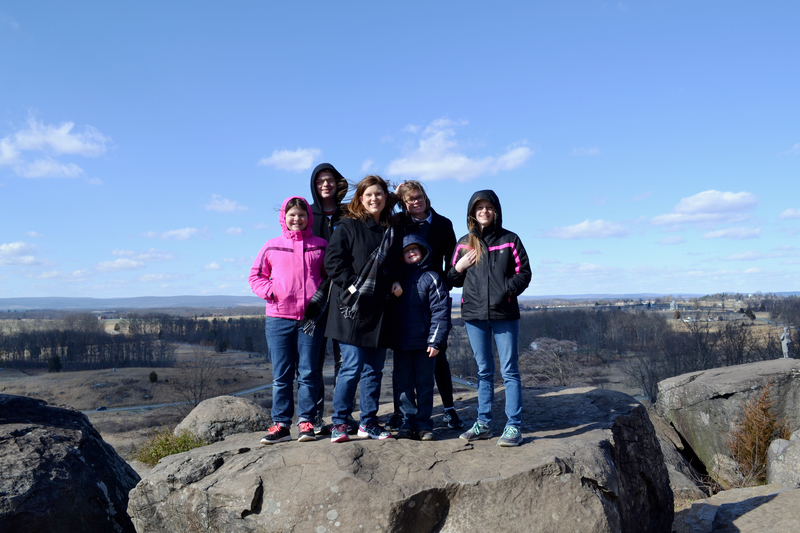 We did a lot of walking and climbing at Gettysburg, and everyone got a good dose of history. And just think, this was only the beginning! Great pics! Really enjoyed the stories and photos. Must be exciting for the kids. So happy you and the family got to make the trip. These places are in my ‘bucket list’ 🙂 and don’t know when we’ll be able to make the trip. I’ve visited 15 different states but never been to Washington DC, Maryland and Virginia. Oh I highly recommend it! I never dreamed I’d get the chance to go, though I’ve wanted to for years. I never thought I’d see Mt. Rushmore either, though. The Lord is so good. I am glad to get to get a little taste of your fantastic trip. What an experience! Such a great experience for you all! 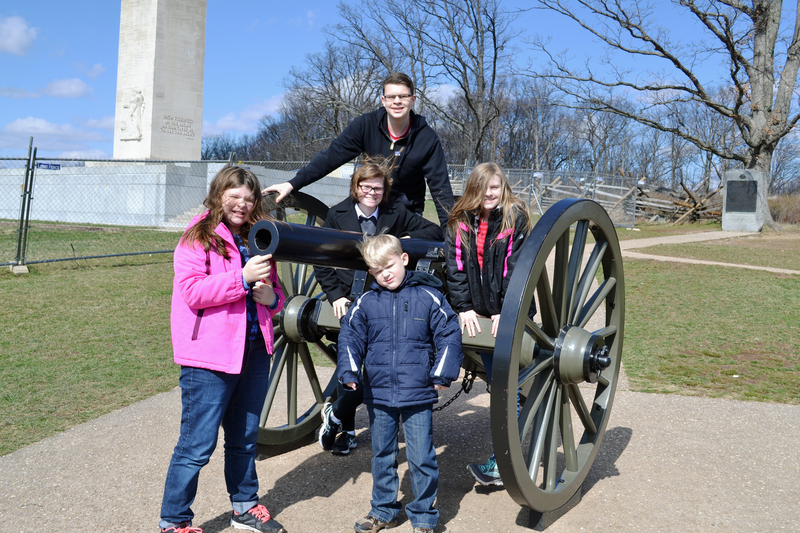 We thoroughly enjoyed Gettysburg when we visited a few years ago and learned so much. 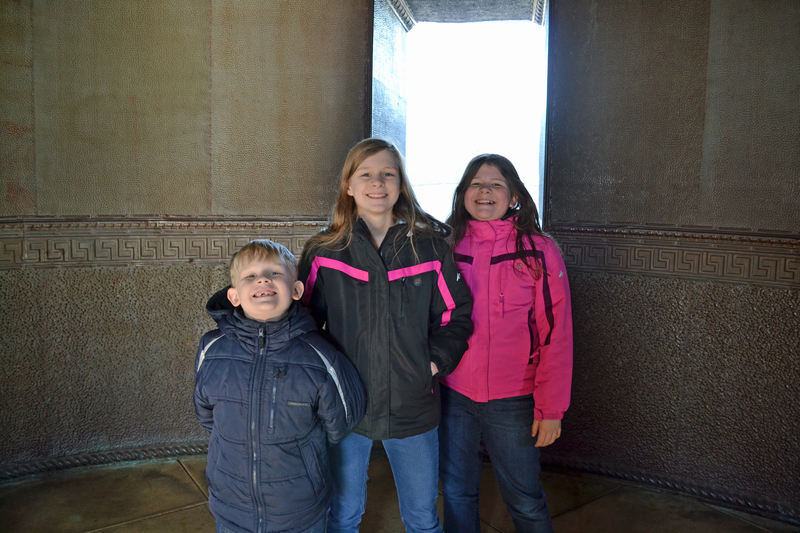 I love how places like that make history come to life for the kids…and us too! Looking forward reading the rest of the posts!